You’ll flip for these simple no-sugar-added flapjacks, which are packed with 22 grams of protein and 10 grams of fiber. 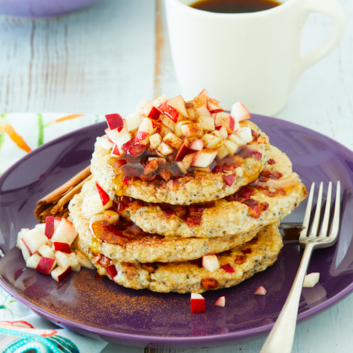 There’s no need for a topper, but if you’d like, you could make extra sautéed apples to spoon over the top for a mouthwatering presentation. Combine oats, egg whites, vanilla, apples, cinnamon and chia seeds in a small bowl and stir until thoroughly mixed. Set aside. Liberally coat a skillet with oil spray and warm over medium heat. Pour or spoon the mixture onto the skillet, making about 5 small pancakes. Cook each side for about 1 to 2 minutes, until the pancakes are golden brown. Reapply oil spray between flips to ensure the pancakes don’t stick to the pan. Enjoy the pancakes plain or topped with yogurt or a drizzle of maple syrup or honey.